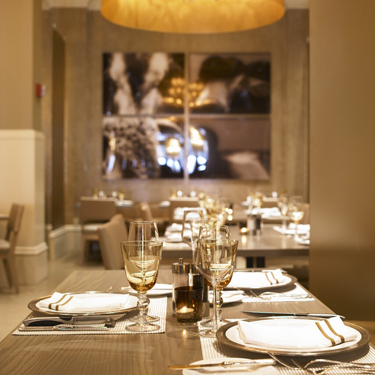 Mooo...., located on Boston's Beacon Hill, is a modern steakhouse within the luxurious XV Beacon Hotel. Chef/Owner Jamie Mammano uses his culinary expertise to create classic, yet modern steakhouse dishes. The warm modern decor provides a relaxed, sophisticated atmosphere, and the restaurant is open seven days a week for breakfast, lunch, dinner and brunch on Saturdays and Sundays. Mooo.... also offers a full bar and an award-winning wine list. The private dining room at Mooo...., The Wine Cellar, is the most exclusive private dining venue in the city. The Wine Cellar offers service in an exquisite and elegant setting - the room boasts high-vaulted ceilings and shows off Mooo....'s extensive wine list by lining the walls floor-to-ceiling with much of the wine featured in the restaurant. It accommodates seated parties of five to 36 people and receptions of up to 75.